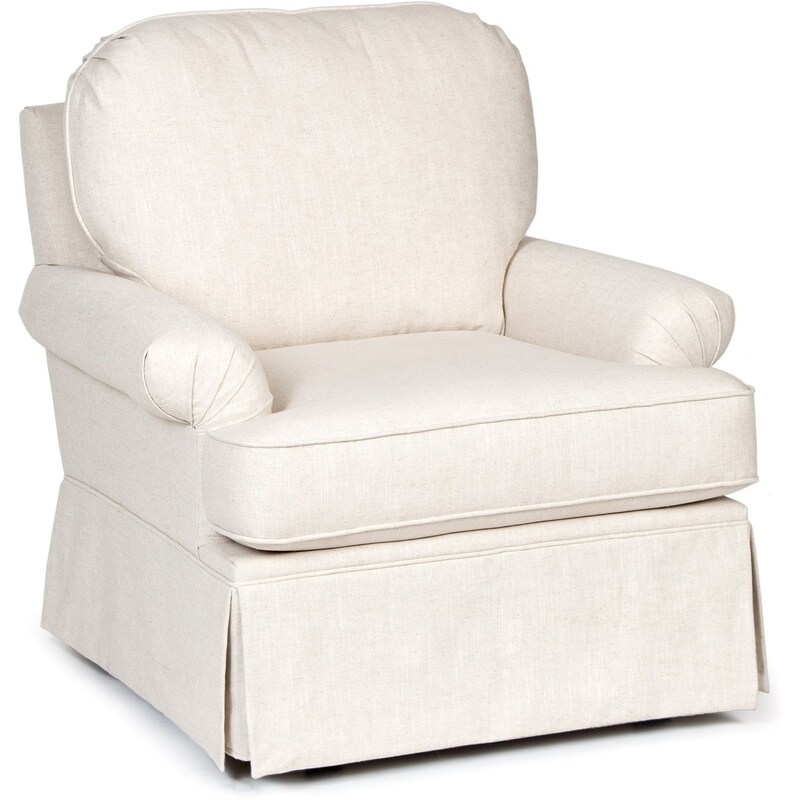 Comfort and style at a great value, add this cozy and classic chair to turn any room into a homey gathering place. Pleated arms and a crisp, skirted base add subtle elegance to this look. A perfect addition to your living room or nursery, this chair is available as a stationary chair, swivel rocking, or swivel gliding chair. See store for available options. The Accent Chairs and Ottomans Swivel Glider with Skirted Base by Chairs America at Royal Furniture in the Memphis, Nashville, Jackson, Birmingham area. Product availability may vary. Contact us for the most current availability on this product. Frame Construction We use all hardwood in the frame, and these are corner-blocked with state-of-the-art cement coated fasteners to ensure a strong and durable frame. Warranty The original purchase is warranted against factory defects for one year. Whether you're looking for a stylish accent or wonderful comfort, this group of accent chairs and ottomans has it all. Chairs feature extra foam padding around the frame and arms, with 1.8 density HR foam seat cores, designed with durability and comfort in mind. With a variety of arm styles, silhouettes, and functions, including glider and swivel chairs, this collection has an option for everyone. Playful fabrics with chic colors and patterns bring each piece to life for the perfect accent for your home. The Accent Chairs and Ottomans collection is a great option if you are looking for Casual furniture in the Memphis, Nashville, Jackson, Birmingham area. Browse other items in the Accent Chairs and Ottomans collection from Royal Furniture in the Memphis, Nashville, Jackson, Birmingham area.